Last August I was disappointed with how the game went, and in fact often have been. The rules I was using just didn’t seem to work with these tiny vessels. they were also really meant for the period just prior to my conflict. 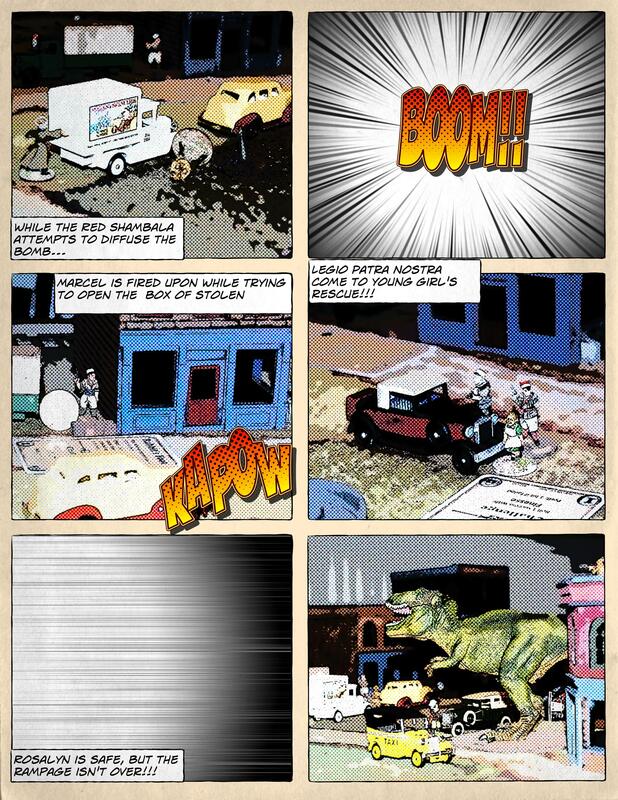 recently I have also been enjoying Pulp Alley as a bit of a diversion from my more serious wargaming. Perhaps it might be a better fit? So I decided to bring out the Mimi and Fifi one more time…. Pulp Alley isn’t really built for this sort of thing. Rather than being a game of military simulation, it is really meant more for recreating the derring do of intrepid adventures that filled the pulp pages in the thirties. the game is amazingly flexible however so I thought it just might work. To do this I relied upon the original rulebook of course, but also the Pulp Vehicle book and the new Pulp Leagues which gives some advice I using the rules in alternate Pulp periods and settings. I decided to make each boat’s crew an individual league which are basically the teams or gangs that each player controls in a game. I used four boats, two for each the German and British navies. Guns are all pretty abstract in Pulp Alley. This is true of the small arms usually used in the games as well as the larger pieces that arm vessels. With no real guideline on how to apply the rules for light, medium or heavy guns, I decided instead to look at the ship’s Weapons and figure out how to represent them differences between them. I was basically only dealing with four different guns. The Kingani had the largest, a six pounder mounted on her fore deck. The Hedwig was armed with a 3 pounder on her bow and a 37 mm Auto cannon on the fantail. The Mimi and the Toutou both on the other hand were armed with 3 pounders on the front and vickers machine guns on the stern. Due to how these weapons work in Pulp Alley I didn’t need to make a real differentiation between the Automatic weapons and the others. What I did was to call the machine guns light, the 37mm autocannon and the 3pdrs medium and the 6 pdr heavy. I alos made the 3pdrs on the British ships advanced which reduces the number of crew needed to man them. I did this mostly to keep the crews at the number they operated with. In a somewhat reverse fashion I gave the Hedwig simple crew characters. these are low lever characters which come with a gun with no cost. This allowed my to increase the number of men available on that larger ship. Due to a lack of fore thought I had no perilous area. This could have been easily resolved by designating shoal or reef areas, or possibly locations where other navigational hazards by be found (sunken vessels for instance). The problem was by the time I thouigh of this it was too late to make any way to mark these areas. I did designate all of the water as an Extreme Peril for any sailors who might find themselves overboard. I also decided to create a perilous area anywhere a vessel might sink, representing the sunken hulk . I did already have markers for this wreckage but it didn’t matter as no ship was ever sunk. I also decided to just forget about Plot Points. These are the goals and objectives of the normal Pulp Alley game. They represent the goals or clues for the adventures to find to drive the course of their adventure. This really being just a historic combat game I gave them a miss. This was to have dire effects on the game! A German Sailor is knocked Back right of the Kingani! I left the ships unarmored except for the Kingani. These were not fighting vessels but rather simple boats converted for their wartime use. The only exception was the Kingani. The gun of the Kingani was armored which in fact caused it to be taken in the historical battle. A round lodged into its gun shield and then exploded killing most of its crew and its Captain. I gave the Kingani one point of armor and a Glacis which added its armor by 1 to the front. Oddly enough in the game an incredibly lucky British shot did take out the gun and most of the Kingani’s crew! The game turned out to be a British victory, which was partially because of a mistake with the fortune cards. The British were incredibly lucky with there cards. They kept getting very useful and powerful cards. The Germans on the other hand found their cards mostly useless. Some of that was because in this scenario they simply did not apply. Many of theirs relied upon plot point challenges and we weren’t using plot points! Or perilous areas which didn’t really exist. We did notice that early on, And I instructed the players that any card the received that seemed unplayable in this version of the game. On was replaced but I think the offer was forgotten after that. If I was to play this again I would either pull those cards from the deck, or preferably include at least the perilous areas. I don’t however intend to play this scenario again. I might however rename the vessels and use them in a game more fitting to these rules. 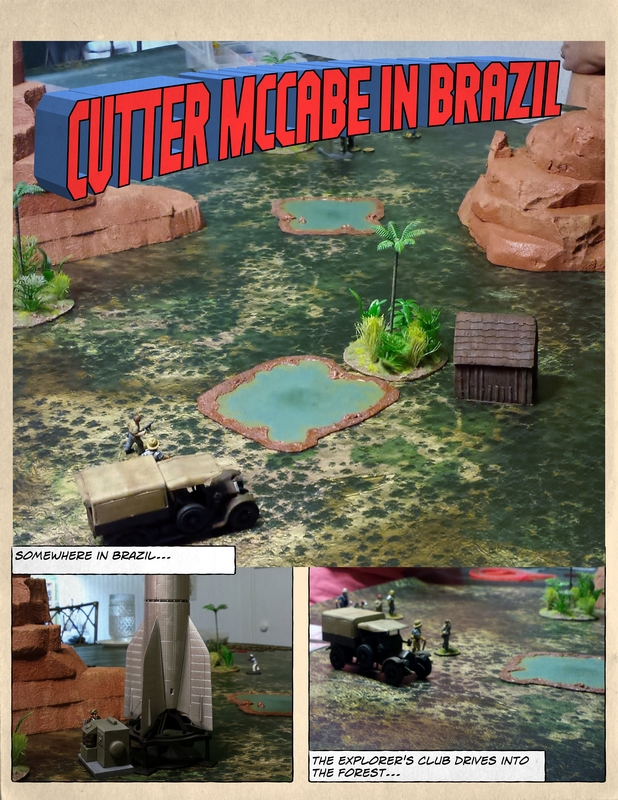 Maybe a raid with items hidden in the bigger boat…..
Cutter McCabe and the Freeze Rocket, a Pulp Alley Adventure! Tonight I ran a little game for some acquaintances just to show them how Pulp Alley plays. These are some of Chris’ friends and he thought they would be interested in seeing the game played. 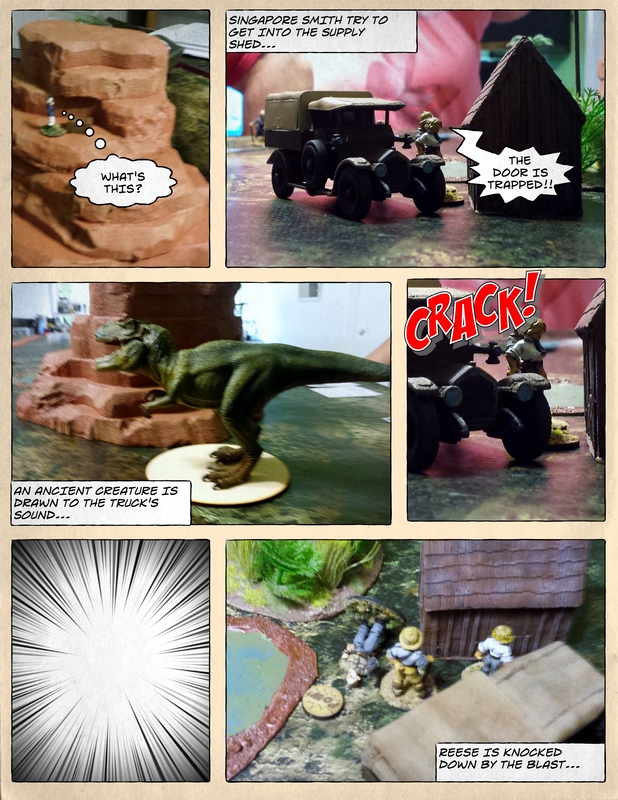 I rolled up a random scenario per the rules in the book, with the exception that Chris also wanted the T-Rex to make an appearance! The game was basically the “Trail of Clues” scenario but with three leagues and a wandering terror. The minor plot points included two dissassembled items (a radio and something else I forget), the supply shed, and a piece of machinery which I have also forgot! I think I left my notes at Chris’ house! The major plot point was the Freeze Rocket. The scenario event list caused all perils to be extreme and gave one of the leagues a truck. We decided to play some of the leagues that I have created but that we have never used. This ended up being Cutter’s Crew, ( a bunch of barnstorming adventurers), the Explorer’s Club (what it says on the tin) and lastly the Crew of the S.S. Venture, (tramp frieghter crew and exotic animal procurers). Everyone seemed to enjoy the game, though a real lack of luck cause it to be some time before any plot points were taken. 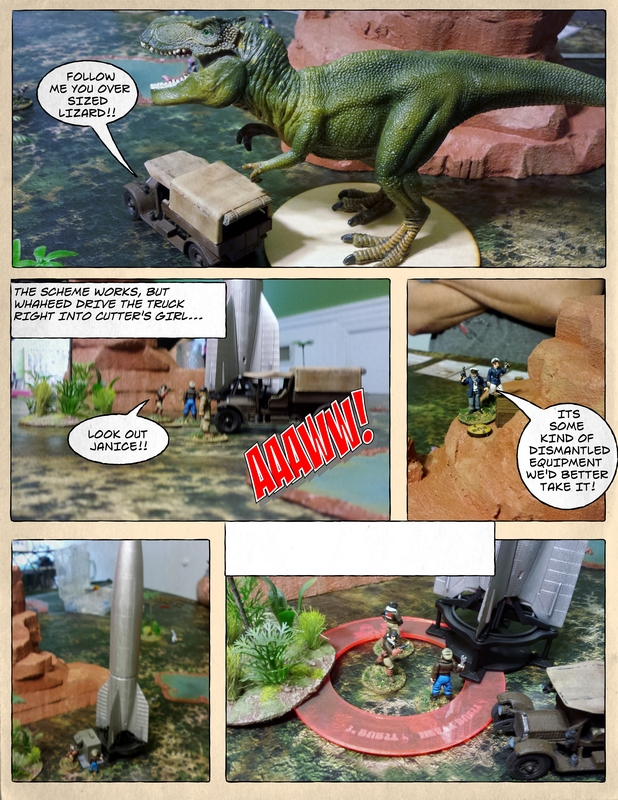 there was also very little combat, though I did have some fun trying to determine how best to play out the dinosaur attacking the truck! 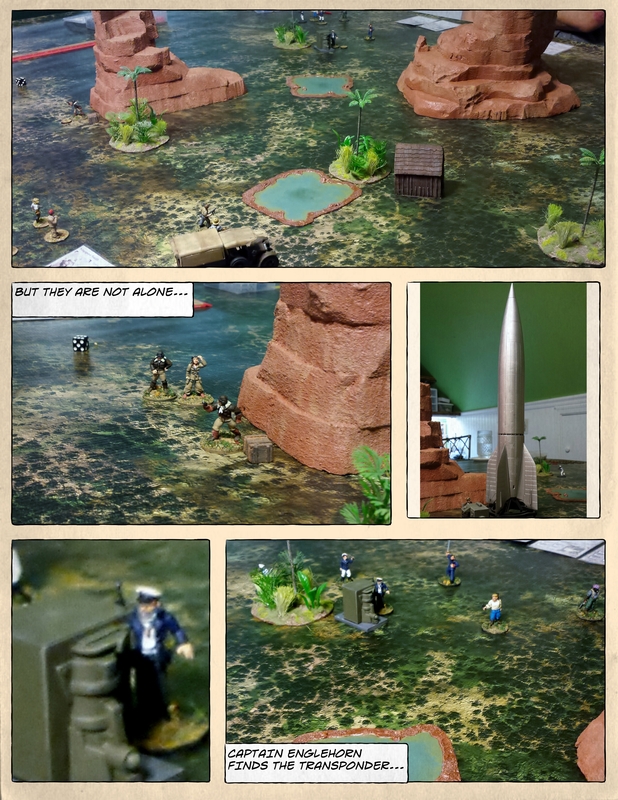 In the end the flyboys (and girl) got the radio and disabled the rocket (and thereby were victorious). Capt. Englehorn and his crew got the machinery and the other disassembled thingy. The Explorers did eventually get into the shed, though it took a few attempts and cause a bit of injury. Looking foreward to the next game! Nonni Petrov and the Hildalgo Fire! 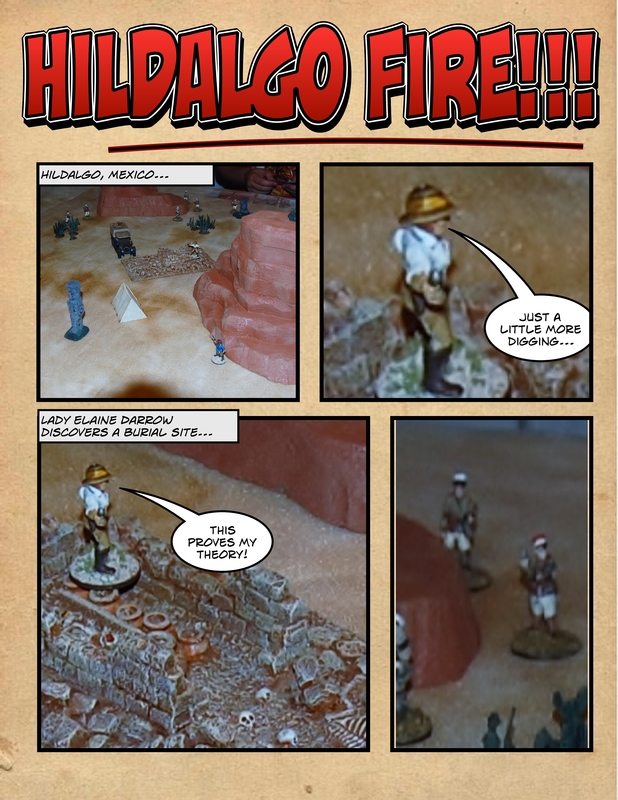 A Pulp Alley adventure! Source: Nonni Petrov and the Hildalgo Fire! A Pulp Alley adventure! 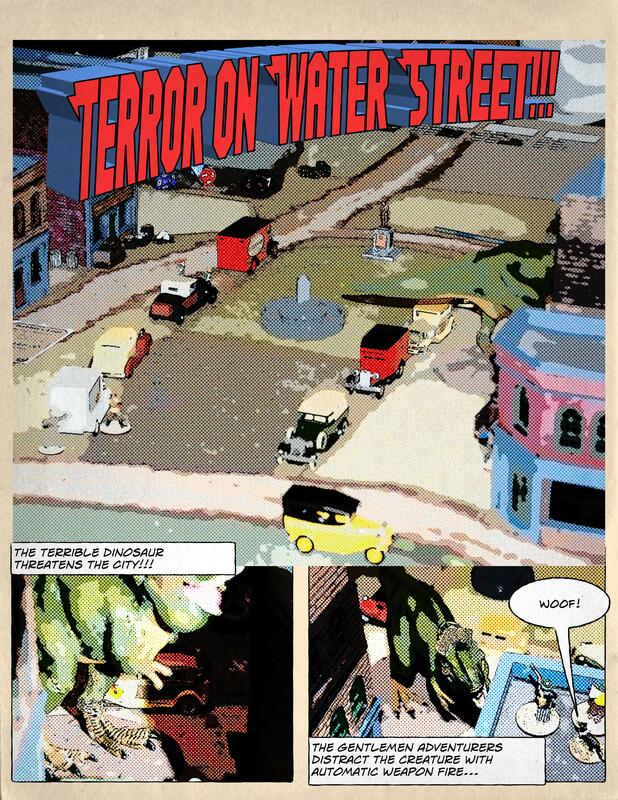 “Terror On Water Street” A Pulp Alley Scenario!!! The major Plot point was little Rosalyn Woodham, the daughter of a wealthy shipping tycoon, she found herself trapped at War Memorial Park by a wild tyrannosaurus rex. The dinosaur had recently been discovered and captured on a deserted island and brought to Manhattan to be exhibited by adventurer and showman Nigel Horne. Unloading the creature from the tramp steamer that delivered it proved more difficult than expected, and the beast freed itself and ventured into the city. The army had been called and the Army Air Corps had attacked the creature but those efforts were stopped when the girl was discovered. Three leagues tried to rescue the girl. The Gentlemen adventurers, for excitement and because it was the right thing to do, the Red Shambala and Legio Patria Nostro, both for their own more mercenary reasons. The Englishmen ended up being chased into the safety of the surrounding brownstones by the Lizard and spent most of their time there, They did manage to wake the Drunk and send him on his way however, right under the drooling mouth of the hungry beast!. The Russians tried unsuccessfully to disarm the bomb, but the explosion left everyone unharmed. The renegade Legionnaires of Patria Nostro managed to save the girl and confiscate the guns though it is doubtful that they intended to return them to the authorities. All of thew leagues departed when the girl was saved, and the bombing recommenced. This was a very enjoyable game, and now that all of our members are familiar with the rules we intend to beginning recording their successes in campaign fashion. I will continue to record their adventurers here and will try to remember to take pictures instead of losing myself in the excitement of the game! First Pulp Alley Game, Trail of Clues! 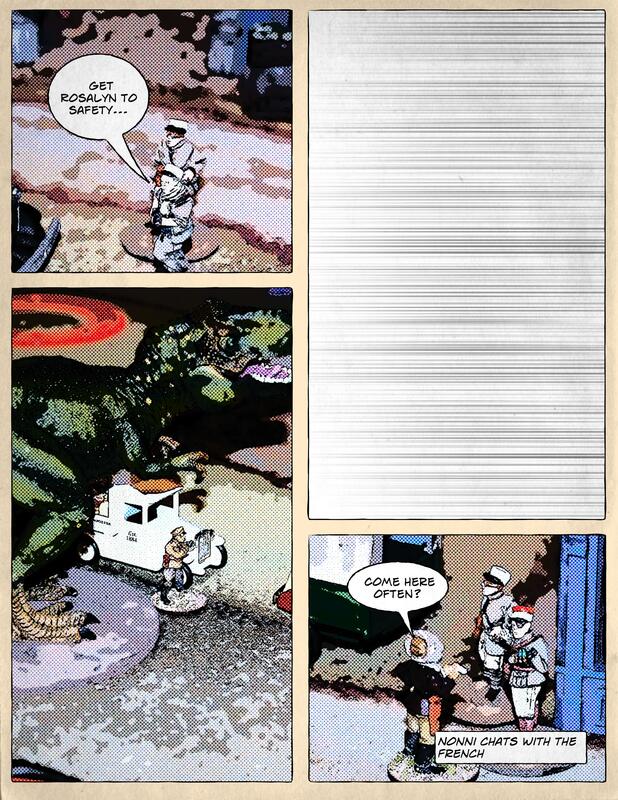 Source: First Pulp Alley Game, Trail of Clues!